Jeff – a professor who conducts studies on infant development at the University of Oregon, works diligently preparing spaghetti in the Galley of the 42′ “Calafia.” Tim – who served 8 years in the Navy working on submarines, speaks of his hatred for country music. Ken – our captain and instructor remains neutral. I sit at the table doing what I do best. Observing. Carrying a conversation with three men twice maybe three times my age seems natural, especially when boating is the area of common ground. We are all tired. Hungry. Just now warming up from a slightly hypothermic crossing back from the Channel Islands off the coast of southern California. I fear one glass of wine will make me want to sink into my bunk and drift off to sleep, all though it is only 6 o clock. I drink slow. Conversation eases, and becomes more personal after last nights “where are you from’s?” and “what do you do’s?” Jeff was the warmest of the three. Happy to be there, happy to learn, happy to admit if he was wrong about something, and could take a joke if it were thrown at him. I can’t say how naturally cruising life felt for him, but his heart was in it and we fed off of each others high spirits. Tim was open about not liking people. He would have never had to say it for me to pick up on it. He preferred his own system of going about things, but had enough knowledge to back up his reasons. Full of mechanical and technical intelligence, all aspects of sailing seemed to come naturally for him, I just wish I could have gotten him to laugh. Ken is incredibly oversupplied with cruising knowledge. He is kind, patient, but doesn’t let things slide. He is there to teach, and expects you to be there to learn. From 8 to 5, small talk did not stray from our sailing education for more than 60 seconds. Always quizzing, keeping us on our feet, and taking every single opportunity for us to learn something. Three point fixes, calculating time, distance, speed and fuel. Locating a tiny buoy miles off shore with no GPS, chart work only. It was fascinating. Pleased with the knowledge I already have from my travels with Katie. I was equally pleased with what I gained on top of that knowledge during this ASA 104 course. It’s pretty hilarious to think of all of the ways Katie and I learned how to do things on our own, and now here I sit having them taught to me the proper way. From navigating, anchoring, docking, reefing, to plumbing, cooking, provisioning, and everything else involved in this life. Trail and error was our style. Katie and I created our own way of doing things, our own routine, and our own rules, possibly even our own language. This system we unknowingly concocted, worked wonders. Most likely because we learned it all ourselves, and most of the time the hard way. We didn’t know what was right or what was wrong. We just put our noggins together and did what made sense in the moment. I feel like a queen aboard the Calafia. So much room for activities. A fridge, water heater, gimbaled stove, two working heads, swim platform, roller furling main, and a big ole Yanmar diesel amongst many other amenities. I am in heaven. I could live like this forever. How the hell did we live aboard Louise for a year? How the hell am I going to go do it again? Louise I love you dearly, but I am starting to think Katie and I are slightly insane. On the other hand, I know why we have become so resourceful. 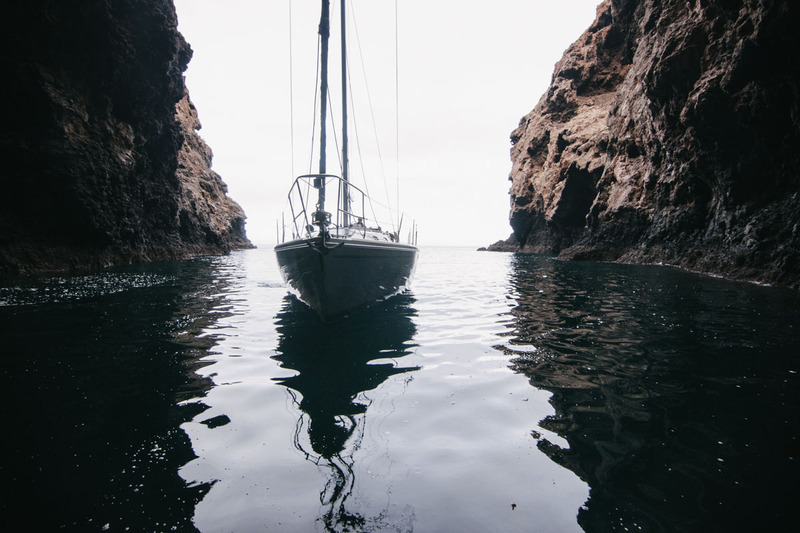 Backtracking – Why am I on a sailboat in California you may ask? Years ago I lived in Santa Barbara and worked at the Santa Barbara Sailing center. It only took two phone calls for me to find myself here again. All I needed, was a job and a place to live. My old manager Ian Fitzgerald, (whom I consider part of my extended family) happily offered me my job back after calling him for temporary work. Meanwhile a wonderful friend of mine Danielle Harvey, happen to have an open room in her house, lease – free. So here I am. Loving this place more than ever before, I will be sad to go. My time here is already winding down before returning to life aboard Louise. Making sure that I use this time wisely, to save, to relax, to sleep well, to eat well, to indulge in all of the advantages that come with living in a home, and the advantages of working for the Santa Barbara Sailing Center. This three day trip has been an awesome opportunity, and I thank Ian for making it happen. It also made me thankful for having a best friend who was crazy enough to start this adventure with me, and crazy enough to do it all again. One more month. Back to it. Excellent news, great post, as usual. We are on the Fille, in Nanny Cay Marina, Tortola. Just hanging out,the weather is wet, but the bars and wine are very comforting. Liz and Mike and our other daughter are joining us for Christmas in a couple of weeks. Have yourselves a great Christmas, hope to cross paths in the future. took ASA lessons there for our honeymoon 15 yrs ago. Fetchin’ Gretchen!. Then on to our CAL 27 and added the CAL 36 five years ago. thanks for the reminder of our time there. Where/when next on “Louise”? ASA is great, but there’s real value in learning via the school of trial & error, as you know! Sounds like you had an interesting mix of characters, including yourself. Keep the posts coming!! I have been following you guys for a while now and I just had to say I am such a big fan! Been a dream of mine since I was 14 to sail around the world. And you guys make it look so fun, not to mention beautiful photo’s and excellent writing. Super stoked to read that you made the cold venture to the Channel Islands. My dad and mom just bought a 34′ Catalina and live in the Channel Islands Harbor. So happy the dream is getting closer to home! (literally). I wish you and Katie the best of luck when you hop on Louise again. I look forward to reading more posts and it would be so rad to connect with you guys one day! I did my ASA 104 on Calafia several years back with Ken – glad to see he is still at it! It was a terrific experience. Coming back to SB from the Islands we were in low clouds (totally grey!) with 8-10 foot swells and 15 knots of wind. A thrill ride – especially watching for cargo ships bearing down on us in the shipping channel. If you see Ken, give him my best! website. I am hoping to see thee same high-grade content from you in the future as well. Total props to the Santa Barbara Sailing Center — I’ve used them several times, from evening charters to sailboat rental. Great people to work with!